Kitty cats, on the left you’ll find Chloe’s luxurious Paddington Leather Padlock Satchel – the very same one dangling delicately from the arm of Kate Bosworth, Nicky Hilton, Mischa Barton, Katy Perry, Alessandra Ambrosio, Halle Berry, Paris Hilton, Nicole Richie, Jessica Alba, Lindsay Lohan and many more of your favorite celebutantes; on the right you’ll spot baghaus’ Madeleine Padlock Tote. Though the baghaus beauty is made out of synthetic leather, as opposed to the calfskin leather making up the couture Chloe piece; for just $39.95, as compared to the $1,875.00 price tag of the original, it is every bit as magical as its high priced predecessor – and leaves room for the budget fashionista to indulge in more than one color! Thanks to Nordstrom and baghaus for the pictures. Spot on steal! And for such a lovely price! WOW that's such a big difference in price & they really look alike!!!! I'll take the cheaper one with the synthetic leather. It doesn't bother me at all to have non-real leathers. Both are hot tho! huge diff! i like them both! I have found your blog seriously, a few seconds ago and I love it already! I really, really really like the bag too! And if anyone is like me and I totally abuse my bag by shoving too much in it...I would always rather be thrifty and not have any problems if I ruin a very nice bag! Holy wow. I want them both, lol. I think the bag CLOE is much better, for me. I am rolling with Chloe I can never go the thrifty route with handbags! I'll have to say the "real deal" when it comes to this one! I've seen the Chloe Paddington in person and it's just divine! Usually the quality leather, hardware and craftsmanship on designer bags is far superior to its "inspired" counterparts. BTW - No Twins ;o) Only two sisters that the world seems to swear we look alike! I personally don't see it. Very nifty. But I gotta say, the Chloe wins simply because the texture and color are part of this bag's charm. Oh my goodness, I LOVE the concept of the lock on a bag. What a great idea! And $39.99???? SCORE! Great find, Erika! It's pretty, but not $1000 pretty! Hmmmm... The Chloe Paddington is pretty much my dream bag... Will have to be a spendthrift on this one! But am duly impressed with your thrifty find, darling, as always! My heart is still with the Chloe! I'm developing my own awards, keep watching my blog and facebook for my details . 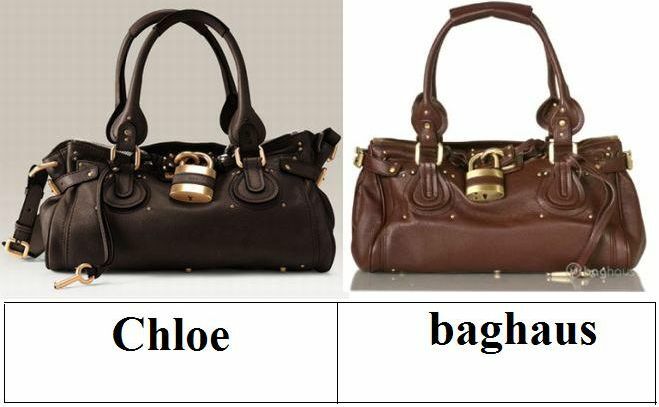 the baghaus one looks great, but i'd still go for the chloe bag! Oh, I'd hate to kill a calf over something like that. I love the Chloe Padlock bag. It is such an iconic bag. The way I go through bags, might as well go for the cheaper one. I'm cheap. So much cheaper than even 40 bucks. But I'd so keep that style in mind while on the hunt at thrift stores and even Dollar General. Definitely thrift on this one. I'd hate for someone to see me in public with something that expensive. The baghaus version looks so similar to the Chloe so I think I'll have to be thrifty this time around! hi darling. ah i remember lusting after that chloe bag for such a long time.. now id forgotten about it-- but here you go with your great post-and make me wanna get it get it get it... but then- probably cant afford the original.. the other is very much alike.though i bet especially the feel is such a big difference. The original sure is to die for, but the sensible option would be the baghaus. I'll have to check it out; I've been looking for a bag like that. Wow... that IS a steal! I love the baghaus one! The color especially. That could totally be my go to bag. Wow. Gorgeous bag--I can't believe it's under $40! I actually like the milk-chocolate shade of the cheaper bag -- so cute! Spendthrift for sure! Oh my gosh I even love the color of the cheaper one better! Ooo, great steal find! It's a gorgeous purse! I'm a sucker through and through. I'm torn. I like the color of the Chloe bag. But $18k+??? I juts love the shape of these beauties. Huge price difference - that is a steal - love it!!! Please stop by and enter my first giveaway for an Orient Watch! So cute, they look so similar! WELL...usually I go for the steal, but when it comes to handbags, that's where I do the splurging...If I HAD the money for the Chloe bag, then I would get the real thing. The craftsmanship on these bags is what makes them last a lifetime. HOWEVER since I do not have the money for the Chloe bag...I guess I am going to have to be thrifty aren't I?? If I could, I would go for the Chloe, but I can't, so I'm thrifty today! Chloe bags are forever beautiful. They're stylish and would definitely go with any outfit. Even if you're just wearing a casual outfit, pair it with a Chloe bag and you're gonna be a stunner.